Peanut butter is a delicious peanut spread that is enjoyed by millions of people. The question if peanut butter is good or bad for you is hotly debated. Peanut butter can be healthy for you because it contains vitamins, minerals, fiber, and is a good source of protein. However, some say that peanut butter is bad for you as it contains a lot of calories and fat. What is the truth behind the health benefits of peanut butter? What can eating peanut butter do for your body, and should you be worried about the amount of fat it contains? In this article, you will learn about scientific research into the health benefits and concerns of peanut butter. You will also find out which is the healthiest type of peanut butter to enjoy and the recommended portion size. Peanut butter is made from peanuts that have been ground into a spreadable paste. Real peanut butter should only contain peanuts and can come in smooth or chunky varieties. The health concerns about peanut butter are generally related to unhealthy added ingredients in some varieties. Some peanut butter brands contain added sugar, salt, oil or other additives to modify the flavor. However, these ingredients can turn peanut butter into a food that is bad for you. Peanut butter has a shelf life of around 3 months once opened and longer if kept in a refrigerator. In time, peanut butter can go rancid where its bitter taste is a sign that it has gone bad. Peanut butter also comes in a powdered form called powdered peanut butter. This is sometimes referred to as PB2 powder. Powdered peanut butter may contain little fat and fewer calories, but it also contains fewer nutrients and vitamins that peanut butter contains. In this article, we will focus on the question if regular peanut butter is a healthy food or is it best avoided. The quick answer to the question: “is peanut butter good or bad for you?” depends on the type of peanut butter you choose. Because it has a lot of calories, eating too much peanut butter is not good for your waistline. Also, cheaper, commercially produced peanut butter is not good for your health. These cheap peanut butter brands can be high in added sugar, saturated fats, unhealthy oils, and salt. The nutritional value of peanut butter shows that it is a functional food that can be enjoyed in moderation. Smooth and chunky peanut butter are also good sources of dietary fiber. A portion size of two tablespoons of peanut butter have 1.6 g of fiber which is 7% of your recommended daily intake (RDI). 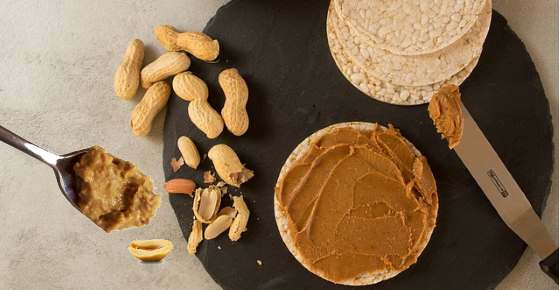 Peanut butter nutrition information also shows that it contains 50 mg of magnesium (12% RDI), 115 mg of phosphorus (11% RDI), and 0.5 mg manganese (23% RDI). The nutritional value of peanut butter also comes from trace amounts of calcium, iron, potassium, zinc, and copper. Because peanuts are naturally high in vitamin E, peanut butter is also a good source of this antioxidant. One serving of peanut butter contains 15% of your daily vitamin E needs (2.9 mg). Natural peanut butter contains 3 grams of sugar in 2 tablespoons. However cheaper varieties may have added sugar that is not good for you. So, it is important to check the labeling to see if your peanut butter contains healthy amounts of naturally-occurring sugar. Peanuts are also a rich source of polyunsaturated omega fatty acids. Research has found that peanuts are high in omega-6 linoleic acid. Peanut butter has negligible amounts of omega-3 fatty acids (in the form of alpha-linolenic acid). (15) Later on the article will discuss why too much omega 6 and low amount of omega 3 is not good for you. When it comes to the saturated fat content in peanut butter, it is important to remember that some saturated fat in your diet is necessary. Of course, peanut butter can be bad for you if you eat too much of it regularly. The recommend portion size of peanut butter is 2 tablespoons, which is about the size of a ping-pong ball. That serving contains about 190 calories, 145 of which come from fat. Even though peanut butter is a calorie-rich food, consuming 2 tablespoons a day is only 190 calories which give you 9% of your daily energy needs. Also, with this portion size, peanut butter gives you 7 g of protein and only 7 grams of carbs. This healthy portion size of peanut butter will help keep you feeling fuller for longer. There are many benefits to your health by adding a tablespoon or 2 of peanut butter as part of a healthy diet. Let’s look in more detail at why eating peanut butter is good for your health. Two tablespoons of peanut butter only contain 7 grams of carbohydrates and nearly 2 grams of fiber. Because peanut butter packs a punch when it comes to protein and fiber, it is digested slowly. This means it is a good source of energy if you are on a low-carb diet or have diabetes. Find out more information about low-carb diets and why some forms of carbohydrates are necessary for your health. One of the reasons why eating peanut butter is good for you is that it contains healthy fats. Olive oil is also a rich source of oleic acid, and you can learn more about its health benefits in my article about the proven health benefits of extra virgin olive oil. Eating a spoonful of peanut butter a day can help maintain a healthy weight. Of course, because a tablespoon of peanut butter has nearly 100 calories, eating too much peanut butter can be fattening. However, eating moderate amounts of peanut butter on a diet can have a positive effect on your weight. So, peanut butter can be useful on a diet if you only eat it in moderation and watch your overall intake of calories from other foods. If you are battling the bulge, find out what else you can do to get a slimmer waist. You may want to incorporate some of these fat-burning foods into your diet. Because peanut butter has fiber and is an energy-dense, protein-rich food, it helps keep you feeling fuller for longer. Having a spoon of the healthiest varieties of peanut butter can lower your risk of coronary heart disease. Learn more about heart-healthy foods such as peanuts that can help to improve your cardiovascular health. Natural peanut butter is a healthy food to eat if you suffer from diabetes and need to watch your carbs. Learn about more foods that help manage diabetes and won’t cause spikes in your blood glucose. Of course, peanut butter contains a lot of fat. So, eating too much natural peanut butter can cause you to gain weight. However, there are some varieties of peanut butter that are definitely unhealthy and are best avoided. Some of the worst peanut butter spreads contain added ingredients such as vegetable oils, sugar, and salt. Find out about the warning signs of consuming too much salt in this article. One of the reasons why consuming some types of peanut butter is not a good idea is that they may contain trans fats. Learn more about the dangers of trans fats and how these types of foods can increase your risk of inflammatory chronic disease. Although natural 100% peanut butter is generally a healthy food, it may contain harmful substances such as aflatoxins. Aflatoxins occur worldwide in many food commodities and they are produced by a fungus called Aspergillus. Peanuts grow underground, where they tend to be colonized by this fungus. One of the disadvantages of peanut butter is that it contains high levels of omega-6 fatty acids and low omega-3. One serving of peanut butter has 4,413 mg of omega-6 but only 24 mg of omega-3 in the form of alpha-linolenic acid. One way to make sure that peanut butter is healthy for you is to take omega-3 fish oil supplements. This will help to balance the ratio of omega-3 and omega-6. One of the reasons why peanut butter can be bad for some people is if they have an allergic reaction to peanuts. If you have an allergy to peanuts, it’s important to completely avoid peanut butter and any other foods that may contain peanuts. If you are looking for a healthy peanut butter, then it is important to choose the varieties that have no fillers. The best and healthiest peanut butter should only contain 100% peanuts and naturally-occurring sugars. To avoid peanut butters that are bad for you, don’t buy products that have added vegetable oil, sugar, salt, or other additives. If possible, always choose organic varieties of healthy peanut butter that only contain peanuts and nothing else. It is good to remember that some organic varieties also contain added oil in the form of organic palm oil or soybean oil.